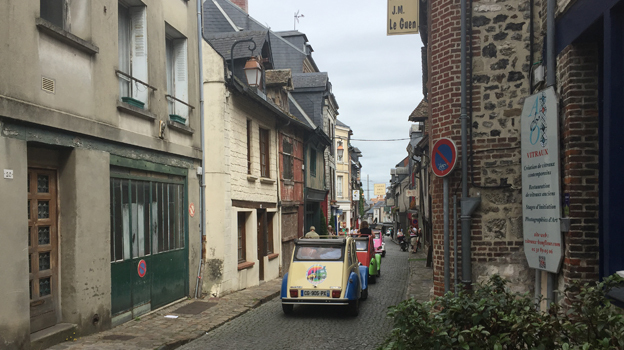 Honfleur is one of France’s prettiest, most charming seaside towns, and Le Bréard is its best restaurant. Chef Fabrice Sérine came back to his hometown roughly twelve years ago. The successful haven of good food and smart ambience he has created is an ideal spot for a carefree lunch while sightseeing around town. 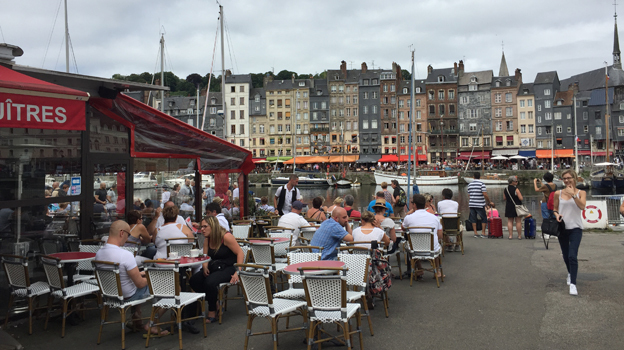 Marvelously situated in the historic Carré des Arts quarter in the historic city center of postcard-pretty Honfleur, close by Sainte Catherine’s Church and the Vieux Bassin port, Le Bréard is easily the best dining spot in town. The small, always busy restaurant is made up of two smallish rooms (calling ahead to reserve a table is a good idea) and an also smallish interior courtyard that supposedly can sit up to sixty people, (no doubt, especially if they’re all thin). 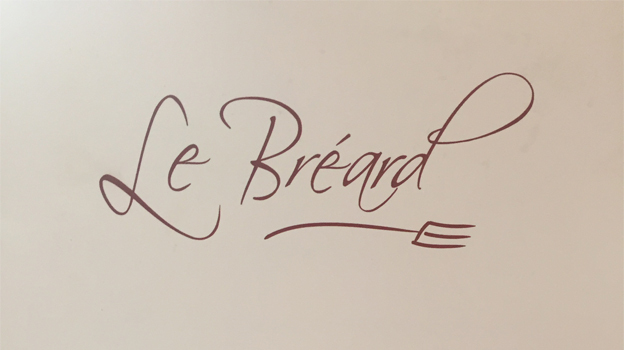 No matter where you eat though, you’ll come away liking Le Bréard’s clean lines, the brisk, hip atmosphere and the artwork from the Gallerie de Tourgéville that is on display. 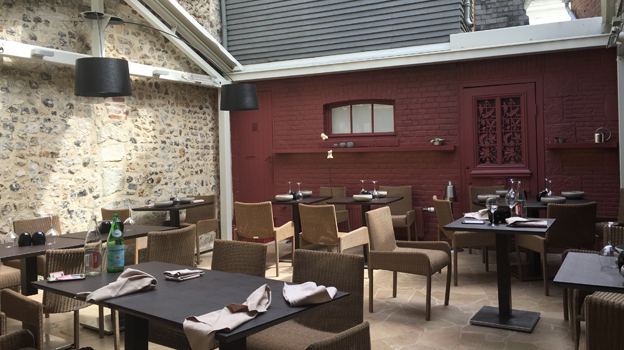 Chef Fabrice Sébire, a native of Honfleur, trained with some of the best, including Alain Senderens at the Lucas Carton, Guy Martin at Le Grand Véfour in Paris and Gerard Bonnefoy, another Michelin starred chef, at Honfleur’s La Terrasse et L’Assiette. After stints in Japan and Sweden, Sébire returned to Honfleur in June 2004 with his wife Karine to take over Le Bréard. Given Honfleur’s seaside location, Sébire is able to source amazingly fresh and flavorful seafood, but he has also done his homework in other areas as well. Witness the number of outstanding ciders available by glass or bottle, including selections from Père David at Blangy Le Chateau and Serge Desfrieches at Ouilly-Le-Vicomte, or the noteworthy cheese selection sourced from François Oliviers, cheesemongers in Rouen with a long family tradition in the business. 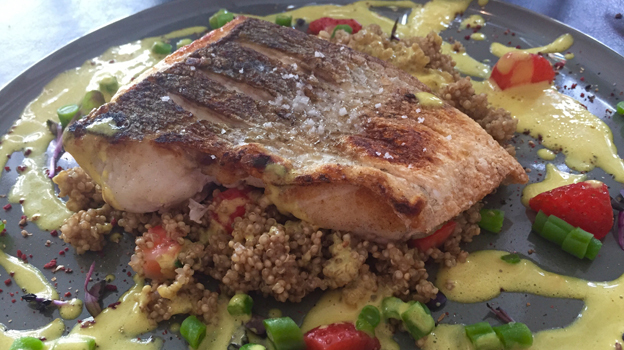 The best way to describe Sébire’s cuisine is with words like fresh, light, crispy, pure, intensely flavorful. Each ingredient stands out in each of his preparations, sometimes almost shocking the taste buds with unusual flavor juxtapositions, though at times these don’t quite work out. After one of the prettiest and best tasting amuse bouches I have had in some time (sushi and a delightful lemon enhanced sabato cream), the tomato appetizer proved a little disappointing. Although a very good idea (nothing better than a fresh, vibrant tomato hors d’oeuvre on a hot summer day) the dish suffered from a certain repetitiveness of flavor and texture. The many different colored tomatoes made it a visually appealing dish, but the zingy acidity that contrasted a candied sweet quality became boring after the third or fourth mouthful. Another ingredient adding a different textural component would have helped, for example something with a little crunch to keep things light and lively. 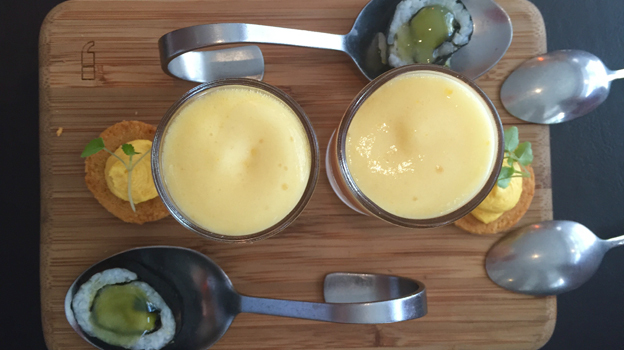 A smaller portion might have offset the risk of palate fatigue. In the end, I wasn’t able to finish the food on my plate. By contrast, everything else I tried was very enjoyable. All things considered, my meal was most certainly a success, The line caught sea bass was a complex, perfectly cooked dish that showcased noteworthy culinary inventiveness and a deft touch. 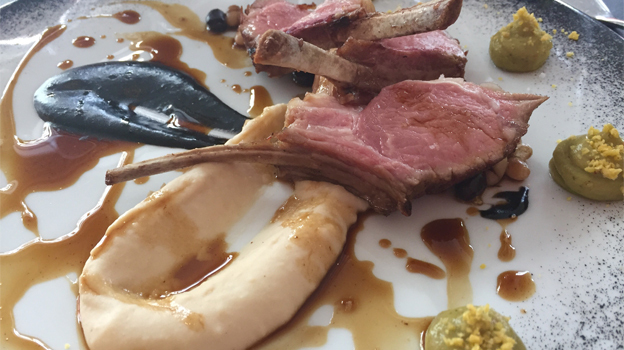 I was equally impressed with the lamb. 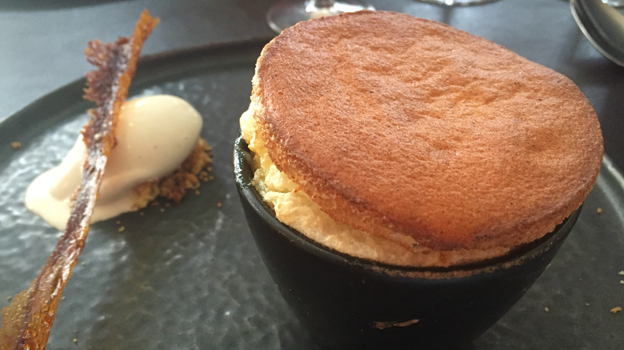 Last but not least, the passion fruit soufflé was so decadent and luscious I could have easily had a second portion. 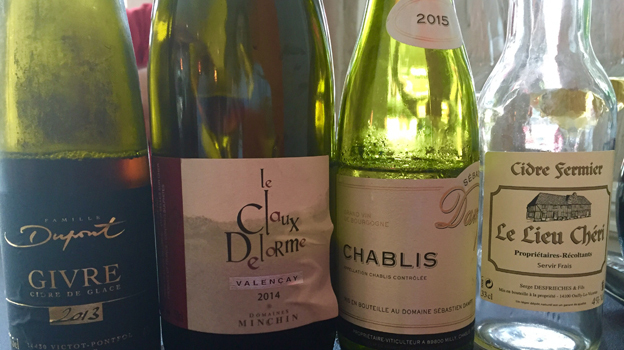 In the end, I chose the 2015 Sébastian Dampt Chablis and the 2014 Domaines Minchin Valençay Les Claux Delorme; both perfectly fine, fresh and fruity, but not especially memorable or worthy of a return “visit”. Perhaps not surprisingly in Normandy, it turns out the best drinks on the night were the ciders. In fact, I started and finished my meal with apple-derived tipples. The Cidre Fermier Le Vieux Chéri Serges Desfrieches & Fils made a wonderful aperitif. Although not especially complex, its fresh apple aromas and flavors were delivered in a penetratingly crisp and pure style. I really could have drunk this refreshing and not especially sweet cider with my whole meal. Even better was the 2013 Famille Dupont Givre Cidre de Glace, an “Iceapple” wine made from frozen apple juice. Unlike in Canada’s Québec province, where the apples freeze naturally, Dupont ferments the apple juice in stainless steel vats and drops the temperature down so as to freeze the water contained within the apples, thereby separating the thicker, very sweet and high acid non-frozen components of the apple must from the water. The result is a liquid apple pie of sorts, with caramel overtones and very good acid lift. At 127 g/L residual sugar, the 2013 was slightly less sweet than some other vintages of this applewine, but really very good and drinking beautifully on this night.